Volkswagen has offered affordable, creative and popular vehicles including the VW Beetle, VW Golf and VW Karmann Ghia models. They are some of the best selling vehicles in the world. Each of our Volkswagen convertible tops is manufactured to original pattern specifications and we offer the original fabric selection. 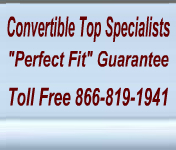 Our replacement Volkswagen convertible tops are available for the Volkswagen Beetle convertible top, Volkswagen Golf convertible top, Volkswagen Cabrio convertible top and the Volkswagen Karmann Ghia convertible top. We offer also a complete line of Volkswagen convertible top parts includes cables, pads and headliners.